So I haven’t blogged for two days, but this is only because yesterday was a travel day, very little happened, but by the time we got home I was too tired to blog! We left Takayama at a decent hour and got on a train to Nagoya. The train trip between Takayama and Nagoya is one of the most beautiful train trips I’ve ever taken, with enormous forests, small towns covered in cherry blossom, and rushing, blue rivers. Truly stunning views. We had an eight-minute change at Nagoya, and, not surprisingly, missed the train. These Japanese locomotives are consistently on time. There was a young couple with a baby and some massive suitcases who missed the train as well, so I can’t complain. We booked new tickets to Shin-Osaka and then had a nine-minute change at Shin-Osaka which we actually made. Go us! Then we arrived at Hiroshima. It was only about 12AUD for a taxi to our hotel, which is very similar to the one in Tokyo and quite comfortable. Dad and Marnie and Margaret went for a walk but I was too tired, so I stayed at the hotel, before they came home and we all went out for okonomiyaki, our first in Japan! If anyone has tried okonomiyaki in Australia, you may not have been all that impressed (I certainly didn’t get what all the fuss was about). But proper Japanese okonomiyaki is pretty excellent. We went to a tiny little okonomiyaki restaurant round the corner from our hotel which looked as though it was run by one guy. He was incredibly smiley and helpful and welcoming, which has been our experience with more or less everyone we have met here, and though he had very limited English, and us with even more limited Japanese, we managed to order. Watching him cook was like watching an artist. Not only was he so attentive and careful with our dishes, but his restaurant was spotlessly clean. I have noticed that a lot here. No matter the size or value of something, the Japanese take immense pride and care in their work and property. It is wonderful to see. He served up our okonomiyaki and we charged through, nearly finishing the whole lot. 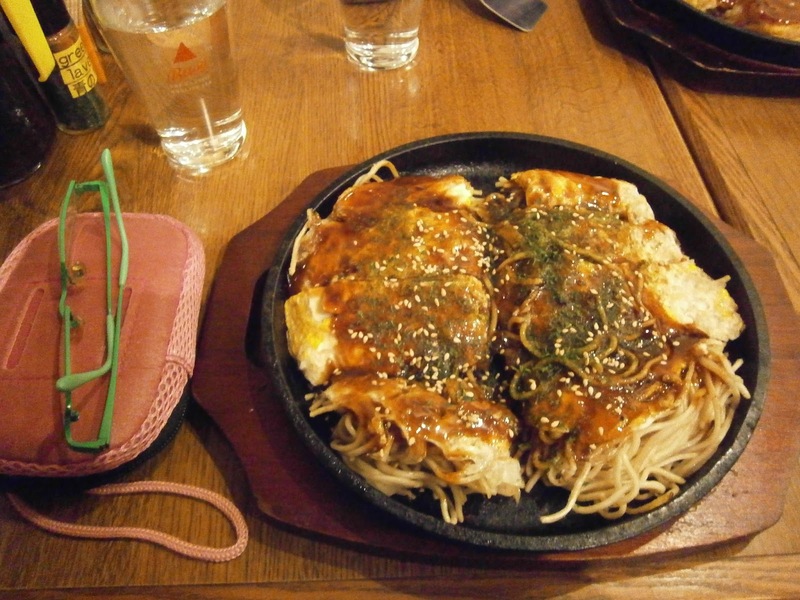 It is a massive amount of food, basically a giant savoury pancake made of noodles, cabbage, pork, eggs and okonomiyaki sauce. Dad and I had squid with ours and it was quite delicious. The hotel provides free breakfast, with all manner of foods – salad, minestrone, miso soup, fruit, sweet pastries, scrambled eggs and sausages, potato salad with cod roe sauce, inari, sushi, waffles…a real eclectic mix. We got up early and ate all we could, then headed down to the marina, only 15 minutes walk from our hotel. We were catching a launch boat to Miyajima, which takes about 45 minutes and it more scenic and more expensive than the JR train and ferry (which would have been free with our rail pass, but taken much longer). The man who looked after us on the launch was very chatty and kept pointing out various sights as we went past them in the boat. When we docked at Miyajima and disembarked, our tour guide met us outside the boat. Her name was Naoko Koizumi and she has been working as a tour guide for about 20 years. Her English is perfect and she is the most obliging, knowledgeable and generous guide I have come across. A private tour with her costs about 35AUD and is worth every single cent. 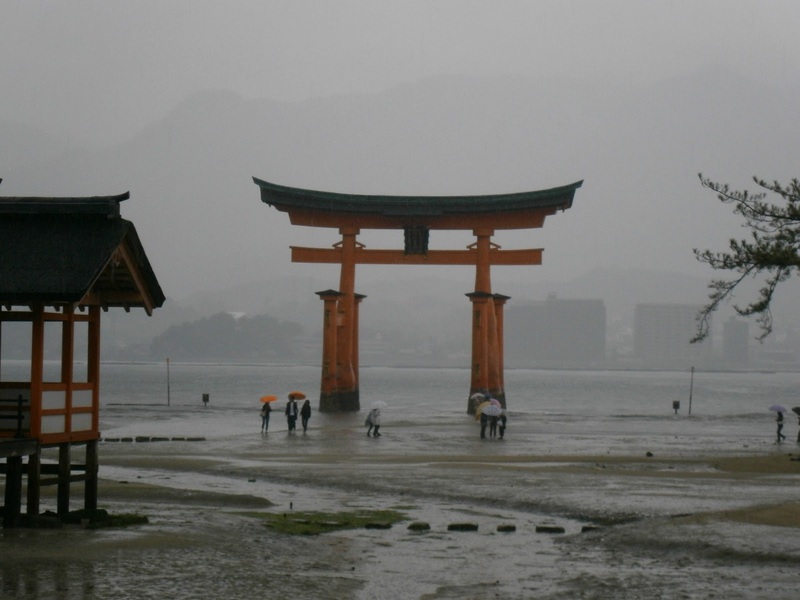 I highly HIGHLY recommend a tour with her if you ever got to Miyajima. When I go back (and I plan to), I will go with her again. (Btw, if anyone IS planning a trip to Japan, ask me for her details and I can put you in touch). Sadly, the rain was constant, all day. Thankfully it wasn’t heavy or too cold. We just put up our umbrellas and got on with it. Naoko was so grateful that we had come on the tour anyway, and was so pleased to inform us that the rain had not ruined the cherry blossom. 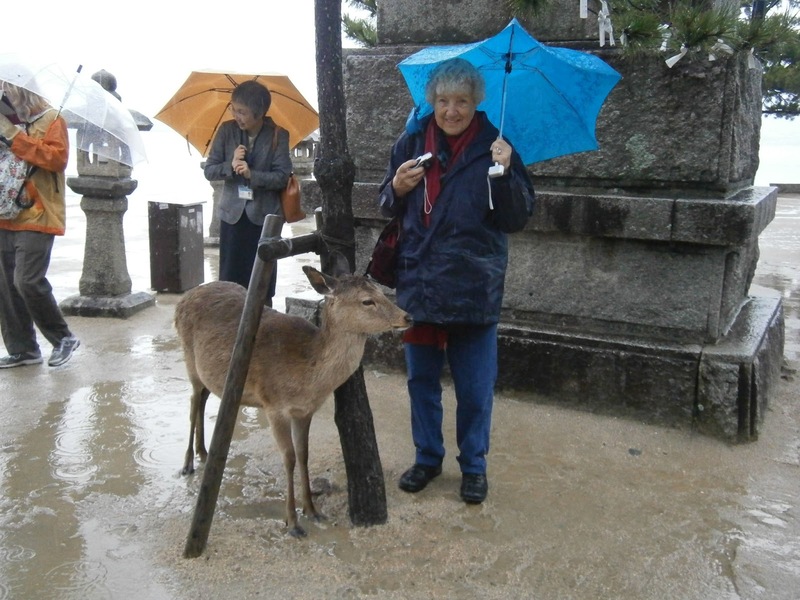 Before I say anything else though, I just have to point out that Miyajima is positively overrun with wild deer. Wild deer, guys. They walk right up to you and stick their nose in your pocket looking for food and I nearly exploded in a fit of warm fuzzies. You could pat them. YOU COULD PAT THEM. I don’t know if you were technically allowed to, but they walked right up to me and demanded it with their big Bambi eyes. Magic. After we tore ourselves away from the deer, Naoko took us through the main shopping street of Miyajima, pointing out popular restaurants to eat at later. The local specialities are oysters and conger eels – not my favourite type of food, but I wasn’t averse to trying them. As we walked up the main shopping street we got excellent views of the five storied pagoda. 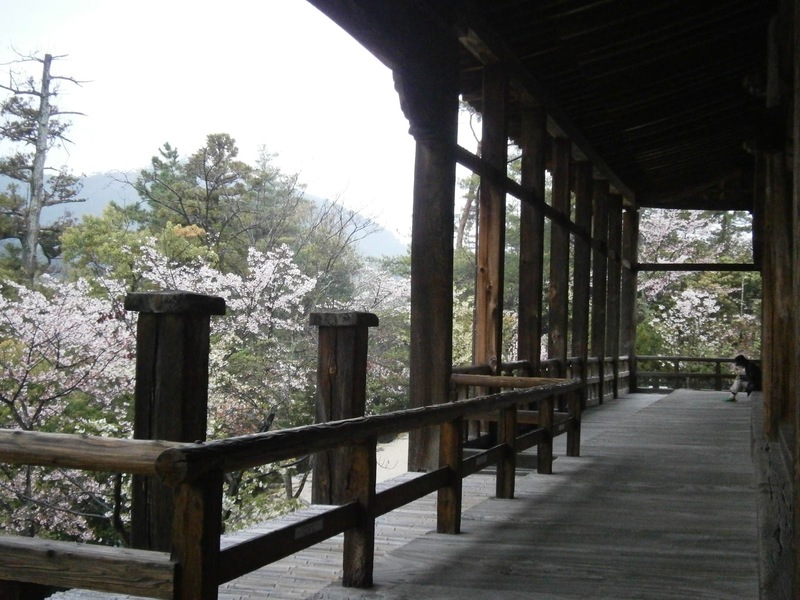 We walked right up to it, amidst a sea of cherry blossom, but you aren’t allowed in. You are however, for the small fee of 100yen (about $1), allowed into Senjokaku, which is a shrine right next to the five-storied pagoda, with beautiful views. 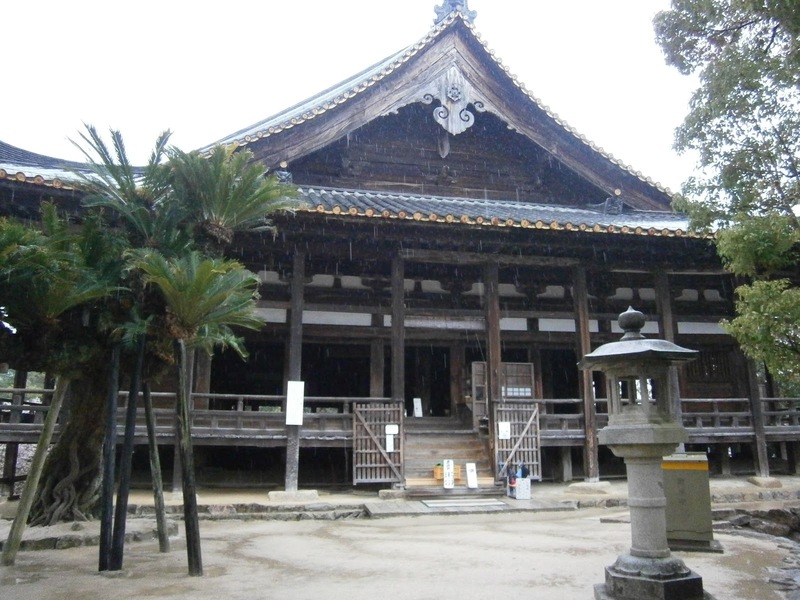 It was built in 1587 by Toyotomi Hideyoshi, but he died before it was finished, so it has remained uncompleted, without walls or a front entrance. Senjokaku means ‘hall of one thousand tatami mats’ but they worked out they could only fit 857 tatami mats in it. 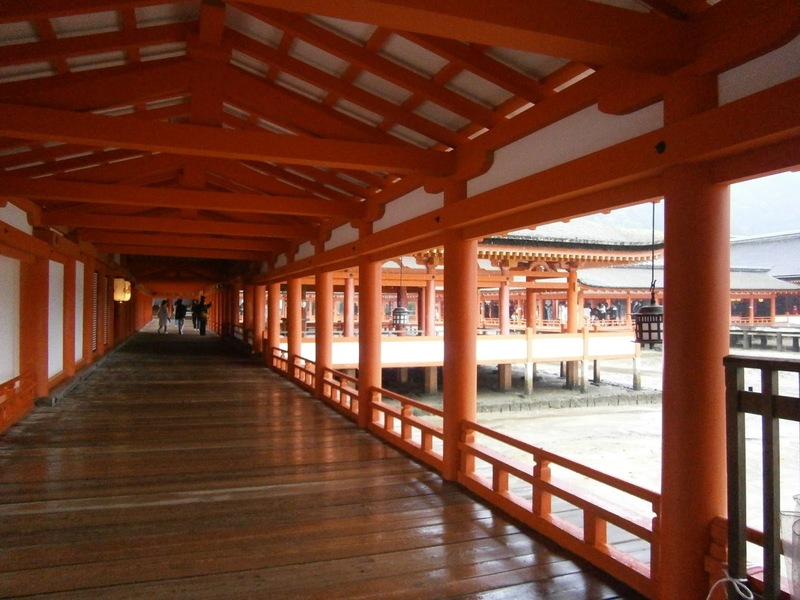 After Senjokaku, we headed down the steps to Itsukushima Shrine, which is a massive Shinto shrine built in 1168. The torii gate is huge, and set out to sea. At low tide you can walk right up to it, but only for a couple of hours each day. We walked around the shrine (only about 300yen) and Naoko explained to us the different traditions and meanings of the architecture and customs. She showed us how to pray (you make a donation and then bow twice, clap twice, and bow once more) and it was amazing to see hundreds of people doing the same thing, no one rushing or getting mad despite the crowds. There are lots of amazing things to see and do in the shrine, but we were on a time limit, so we kept going and had a small break to eat some momiji manju, a local speciality and drink some tea. 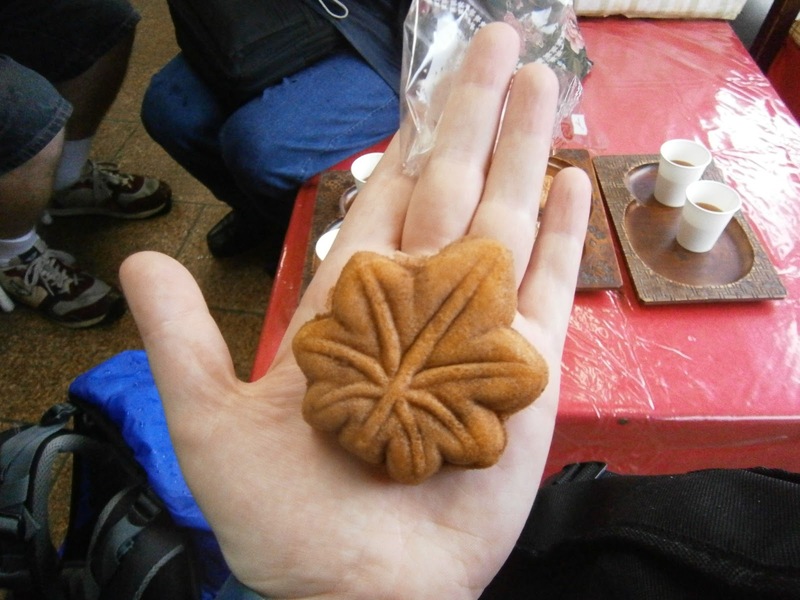 The momiji manju is a little sweet cake, served warm, in the shape of a maple leaf. They have different fillings, and we had red bean paste which was absolutely delicious. Later in the day I also bought a chocolate one and a green tea one because I’m on holidays and that’s what I get to do. After our break, the unthinkable happened and my camera ran out of battery. I will poach plenty of pictures from Dad, but it’s still such a pity because the next thing we visited was easily my favourite part of the day. 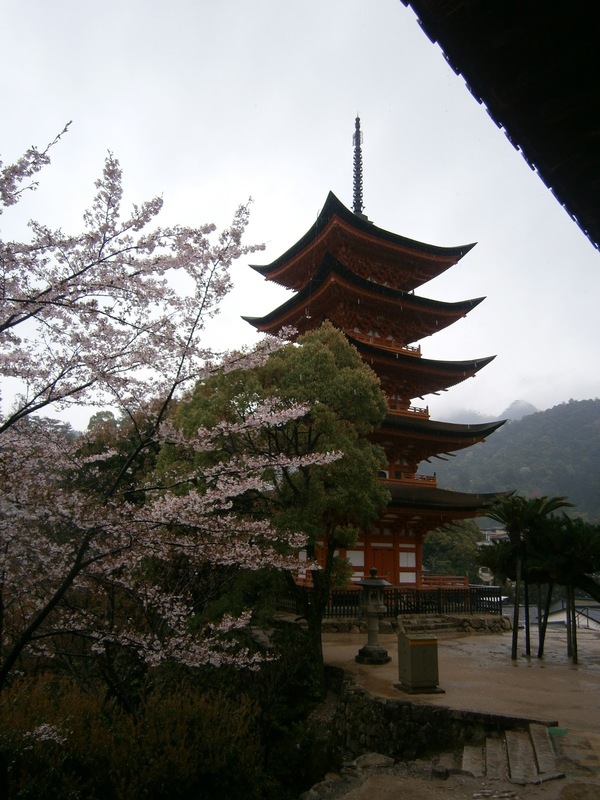 Daisho-in Temple is the most naturally beautiful part of the world I have ever visited. I’m sure that I will see many things to challenge that in my travels to come, but for now I think it is safe to say I have never seen anything so breathtaking. We saw far too many things for me to remember and document accurately in my blog, but please take my word for it and add it to your bucket list if you haven’t already seen it. Highlights that Naoko showed us include the 500 Rakan statues (Shaka Nyorai’s disciples), the Mizukake Jizo (statues who look after the souls of deceased babies and children) and Henjyokutsu Cave (containing the principle Buddhist icons of the eighty eight temples of the pilgrimage route on Shikoku and which you walk around to ‘complete’ your own mini version of the pilgrimage). It was a stunning place, with the rainwater falling and the cherry blossoms and the maples and the rock gardens and the mountains.Wow. To quote V for Vendetta, God was in the rain. Once we finished at the temple, our three hours with Naoko was up. She very kindly walked us back to the shopping street and helped us find a suitable restaurant. We then sat down and rested out feet and ate a big lunch of udon soups, curry and oysters, among other bits. I did try an oyster, and while I could appreciate the superiority of the taste, it wasn’t completely for me, so Dad got to eat the rest. I practised a bit of my very shoddy Japanese, but again, the staff were so lovely and obliging that it wasn’t a problem. After we finished lunch we did a quick shop up and down the street, bid farewell to my new Bambi friends, and got on the launch boat back to the marina. I Skyped with Sean (Hi Sean!) and then we went out – finally! – for ramen!! Yayyyyy!! It was tonkotsu ramen as well – my favourite type. It was even better than I expected and we left the restaurant stuffed full. We took the long walk back to the hotel, stopping at two bookshops along the way. I found a second hand copy of Peter Pan in Japanese so I bought that (that’s the second Peter Pan I have bought on this trip!) and we got back to the hotel just in time to finish this blog and go to bed. Phew!